reading Just finished The Sh!t No One Tells You: A Guide to Surviving Your Baby’s First Year by Dawn Dais. I’m not sure whether or not it was a good idea or a bad idea to read this book. It was quite terrifying, although I suppose I am grateful for the dose of reality and preparations. Just started reading Maine by J. Courtney Sullivan. Stumbled across it last week while browsing at Barnes and Noble and figured I would read it since I went to Maine this summer. It’s more of a beach read about family summer drama. writing Well technically, I haven’t started yet, because my apartment has been a disaster zone since the baby shower, and I haven’t even been able to sit on the couch. HOWEVER, I plan on starting to write out some thank you notes this weekend for all of the lovely gifts we received from our family and friends. listening I think I am late on this song, but I heard it a few weeks ago, and honestly it reminds me of my grandfather who always used to say, “You’re gonna miss me when I’m gone.” Ain’t that the truth, Grandpa. The song is Cups by Anna Kendrick from the movie Pitch Perfect. thinking That every time I think my belly can’t possibly get any bigger…I wake up, and it’s bigger. smelling The Victoria’s Secret Dream Angels Heavenly that I put on this morning. watching The Challenge: Rivals II. I know it’s ridiculous that I still follow these shows, but I just can’t get enough of the drama that unfolds with every new season of a challenge. I also constantly wonder how I would measure up in these challenges. Something tells me I would give those girls a run for their money. wishing That I could fly out to Missouri to celebrate my friend’s Cris and Kate’s big day this weekend! This is the second big wedding we have missed this year, and it’s definitely a bummer to not be there, even though I know it’s for a good reason. Wishing Cris and Kate a magical day and lots of love! hoping To make a lot of progress on our little boy’s room this weekend. I’m really excited for my vision of how it will look when it’s finished, but it’s a long process to get there! I’m hoping we can get a good chunk done this weekend. Am I in nesting mode perhaps? 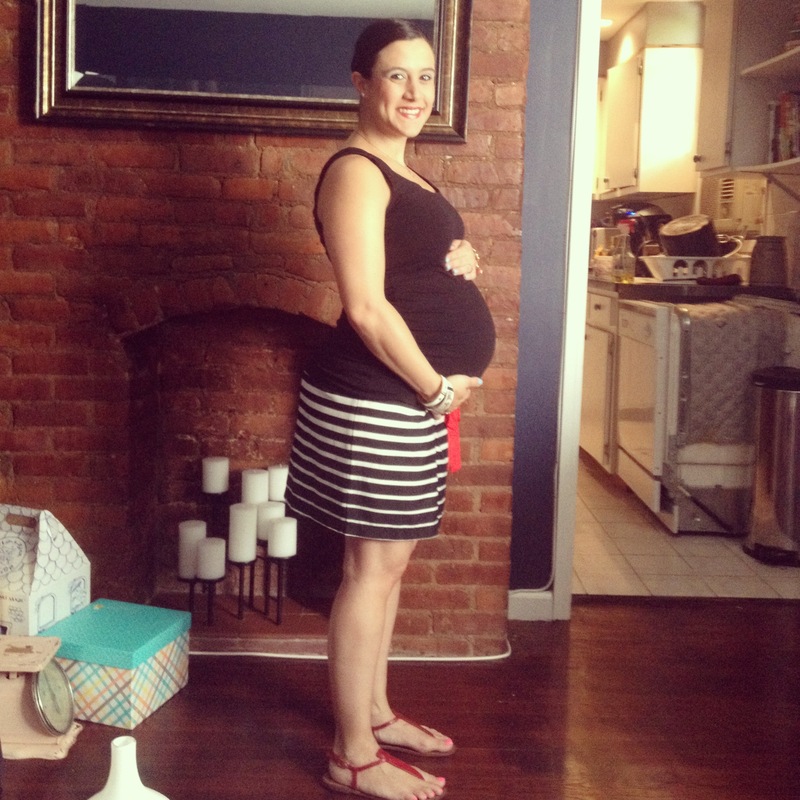 wearing Mint green shorts and a gray and orange striped top (different color here), both from Motherhood Maternity. loving The maternity session photos that Misa*Me Photography took for us! She gave us a little sneak peek, and I am so excited to share them with you all in the next couple of weeks. She did a wonderful job, as always. Stay tuned! laughing At this rendition of Ice Ice Baby that my co-worker shared with me earlier this week. Props to the editor for stringing together 280 movies worth of clips to create this. wanting To swing by the Hester Street Fair on the Lower East Side this weekend. My friends, Nicole and Maria, have a booth this summer for their handcrafted jewelry company, Guilty Jean, who you may remember from these previous posts. (Spring Has Sprung, Preppy With a Twist, Spiked & Studded, and Boho Spring). Looking forward to checking out their latest line! needing Water, water, water. Hydration is key for this prego mama. feeling Alien-like movements coming from my belly. He’s kicking and squirming more and more every day. I swear, it’s the weirdest feeling ever that something is alive and moving inside of you! But it’s also pretty cool. craving Watermelon. Nothing like this delicious fresh fruit on a hot summer day. clicking Through resume after resume. Trying to find someone to fill in for me at work while I’m away. I think we are getting close to making a decision! Happy Friday! Hope you all have a great weekend!